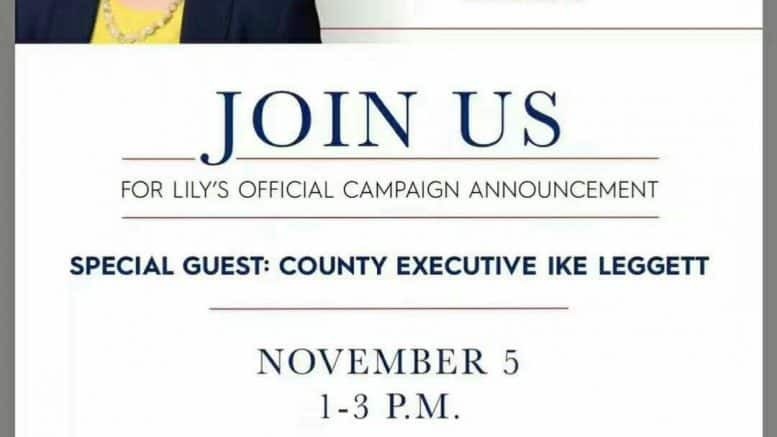 Montgomery County’s Assistant Chief Administrative Officer for economic and workforce development will announce this Sunday that she is running for state delegate. Lily Qi (pronounced “Chee”) will declare her candidacy for District 15 this Sunday afternoon, becoming the first Democratic candidate to officially enter the race to replace outgoing Del. Aruna Miller, who is running for the Democratic nomination in Maryland’s 6th Congressional District. Other Democrats, including Kevin Mack, Andrew Van Wye, Amy Frieder, and Hamza Khan are exploring District 15 bids or are planning to run. Republican Laurie Halverson, who is a former Maryland State Board of Education member, last week indicated to A Miner Detail that she will soon launch a bid for District 15. In October, Halverson was appointed by County Executive Ike Leggett to serve as a Montgomery County Board of License Commissioner. Halverson ran unsuccessfully in 2014 for the Montgomery County Board of Education. District 15 encompasses a wide swath of territory in Montgomery County, stretching from Clarksburg to Potomac as well as Darnestown, Germantown, North Potomac and Travilah. A three-member district, incumbents Kathleen Dumas and David Fraser-Hidalgo, both Democrats, have confirmed they will seek reelection. State Senator Brian Feldman (D) is expected to run unopposed in the primary. David Wilson, who is a newcomer to Maryland politics, filed in March to run for the District 15 state Senate seat. I have spoken with (just about) each of you about my considerations for the next phase of my life in public service beyond 2018. Thanks to your encouragement and advice, I have decided to run for Maryland State Delegate in District 15, an open seat in the 2018 election. Please join me and my family as I officially announce my campaign on Sunday, Nov. 5, 1-3 pm, in the Potomac Community Center, 11315 Falls Rd., Potomac, MD. After years of encouraging and facilitating civic and political engagement and helping other campaigns, I am finally working on my own campaign to more directly affect changes in our State and the County. You will receive an official invitation from my campaign soon. This is a “Save-the-Date” message and an update. If you have a better email, please share. If you would like to confirm your attendance now, please reply to my campaign team copied above. Thank you and see you November 5! Lily Qi is Assistant Chief Administrative Officer for economic and workforce development in Montgomery County, Maryland. Since joining the County government in 2008, she has served in several capacities to advance Montgomery County’s economic competitiveness, government cultural competency and community engagement. Her priority initiatives include establishing two public-private partnerships–BioHealth Innovation and the Montgomery County Economic Development Corporation, and developing the Comprehensive Economic Strategy. She was twice recognized by the National Association of Counties for her work in Montgomery County. Lily’s previous professional life includes serving as Vice President of Business Development and Marketing for the Washington, DC Economic Partnership, spokesperson for the DC Department of Insurance, Securities and Banking, and Assistant Director of Multicultural Affairs at American University. As an immigrant who grew up in Shanghai, China, Lily is also a community leader and influencer. She writes and speaks on immigrant integration, Asian American and women’s issues and actively encourages and facilitates community involvement in civic and political matters. Lily was featured in the Washington Business Journal, Bethesda Magazine, China Daily, and Asian Fortune as an immigrant integration model. Her civic involvement includes serving as Chair of the Maryland Governor’s Commission on Asian American Affairs, President of OCA-DC, columnist for Asian Fortune, and board members of several community nonprofits including Leadership Montgomery, Committee for Montgomery, VisArts, Montgomery Hospice and Commission for Women. She is currently a trustee of the Suburban Hospital of Johns Hopkins Medicine.